Now, what I first hear about America’s Test Kitchen: Let’s Get Cooking , I thought that it was just another one of those cooking games like Cooking Mama which frankly would have been crazy. I mean, can you see a little Christopher Kimball running around taste testing things, or explaining beef cuts in a video game? TV, sure, but not in a video game. It turns your DS into a kind of kitchen computer, as it were. You can select an ingredient, and it’ll show you all the recipes that contain that ingredient. Pick a recipe, and it’ll give you the full details. 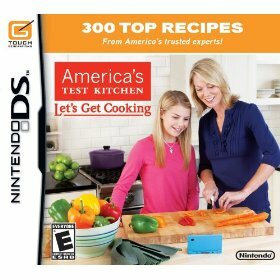 If you already have a Nintendo DS, and like America’s Test Kitchen, this is worth looking at!